The spine column is the body’s main support structure. It is also known as the spinal column, backbone or vertebral column. Its 33 bones, called vertebrae, are divided into five regions: cervical, thoracic, lumbar, sacral and coccygeal. 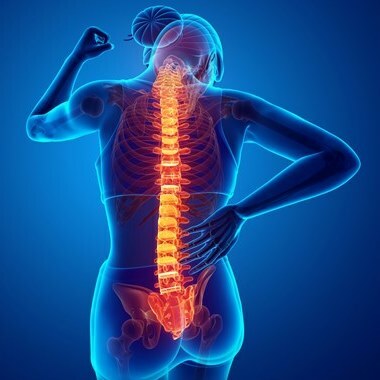 This spinal column provides the main support for your body, allowing you to stand upright, bend, and twist, while also protecting your spinal cord from injury. Strong muscles and bones, flexible tendons and ligaments, and sensitive nerves contribute to a healthy spine. However, when any of these elements is affected by a strain, injury, or disease, it can cause pain. The cervical region consists of seven vertebrae labeled C1 to C7. The first cervical vertebra is called the atlas. The second is called the axis. Together, the atlas and axis form the joint that connects the spine to the skull and allows the head to swivel and nod. The coccygeal region, commonly called the tailbone, consists of four small vertebrae. These tiny bones may be fused or separate. Together they form the coccyx, an attachment point for various muscles, tendons and ligaments. The coccyx alsohelps support the body when a person is sitting. All together, the vertebrae of the spine’s five regions support the weight of the body and protect the spinal cord and nerve roots. Each individual vertebra has a complex set of structures necessary to the overall function of the spine. The main structure of a vertebra is the vertebral body — a cylinder-shaped section of bone at the front of the vertebra. It is the main weight-bearing section of the vertebra. Behind the vertebral body is the vertebral canal. The spinal cord travels through this channel. The spinal cord is the main bundle of nerve fibers connecting the brain to the rest of the body. The spinal cord ends near the L1 and L2 vertebrae, where it divides into bundles of nerve roots called the cauda equina. Exiting the sides of the spine are nerve roots, thick nerve branches that transmit signals between the spinal cord and the other parts of the body. On either side of the vertebral canal are pedicle bones, which connect the vertebral body to the lamina. The lamina create the outer wall of the vertebral canal, covering and protecting the spinal cord. Protruding from the back of the lamina is the spinous process. It provides an attachment point for muscles and ligaments that move and stabilize the vertebrae. Transverse processes protrude from the sides of each vertebra. Muscles and ligaments that move and stabilize the vertebrae attach to the transverse processes. The articular facets form the joints where each vertebra connects with the vertebrae above and below it. Each vertebra has four facets (two superior facets and two inferior facets). The facet joints have a covering of cartilage, which allows movement. Between the vertebral bodies are the tough, elastic spinal discs. They provide a flexible cushion, allowing the vertebrae to bend and twist. Each dischas a tough outer wall called the annulus fibrosus and a soft interior called the nucleus pulposus.